Don’t know what ‘in the vortex’ means? … well, you aren’t alone. From the number of Twitter and Facebook questions I receive and from search phrases in my web stats, many people are a little confused about what this new metaphysical catchphrase really means. Where Does ‘In the Vortex’ Come from? 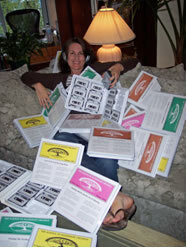 It comes from the amazing work of Esther and Jerry Hicks and their Teachings of Abraham (see www.abraham-hicks.com). Esther is a ‘translator’ for Abraham, who are (as they tell it) a cluster of non-physical intelligence. They refer to themselves in the plural (we) rather than singular (I). And Esther receives ‘blocks of information’ from them that she matches up with the best language that her sub-conscious mind can muster. (if you are new to this, yes, I know, this can sound kooky – rest assured, I used to think that too). People go to Abraham-Hicks events to ask questions of Abraham via Esther and to listen to the impressive answers that unfold. I first stumbled upon their work around 2000 and have been increasingly hooked since – attending four of their cruises, many live workshops and I’ve attracted the fortunate opportunity (over several years) to listen to their workshop recordings circa 1990 to the present (over 600 tapes and CDs). Has had a huge impact on my work and on me personally. Jerry and Esther have hosted basically a workshop a week for the last 20 years and they keep on going — as does the evolving message. It changes due to the evolution and nature of questions that are asked. “In the Vortex” is the latest evolution of Abraham’s message – as they are always looking for phrases, stories and anecdotes to better communicate their concepts. In recent workshops they repeatedly and lovingly encourage, prod and tease us to ‘get in the vortex’ – as an answer to basically any human dilemma. And, that we are a complex multi-dimensional being and much communication occurs between the two parts of ourselves. Understanding the two parts of our overall being is necessary in order to really understand the ‘In the Vortex’ concept. The vortex then, is simply the connection or alignment between your non-physical self and your physical self – the link between you and you. Our non-physical selves are totally ‘tapped in, tuned in and turned on’ to all that we truly are. However our physical selves have the habit of disconnecting from this awareness. Reconnecting our physical and non-physical selves is what ‘in the vortex’ means. Thankfully we have a built in system that tells us when we are in alignment with our Inner Being (and that we truly want and desire) and when we aren’t. This built in system is our emotions. 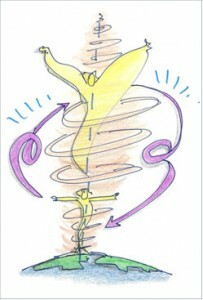 Simply put, when we are in high, uplifted and enjoyable emotions we are in the vortex. When we are in low, downtrodden and painful emotions we are out of the vortex. And, we do have the power to bridge this gap. Being in and out of the vortex is an ongoing, in and out process. As Abraham tells us, it’s not like a degree you get that you have forever more. Its natural, and in fact necessary, to go in and out. Being out of the vortex (or in contrast) is helpful as it feeds new clarity, ideas and desires to our Inner Being (who instantly lines up with them). Whether or not our physical self has the same pleasure is up to us. Getting in the vortex is a matter of emotional or vibrational change. You need to shift your emotional (and vibrational) state from lower to higher. In essence, you need to become more Inner Being like and embody an optimistic, empowered and positive relationship with yourself, others and life in general. When you do so, not only will you feel happy, content, secure, appreciative, and joyful, but you will now be in the vibrational vicinity to all that is at match to that as well. There are many, many ways to get in your vortex – and different things work for different people. 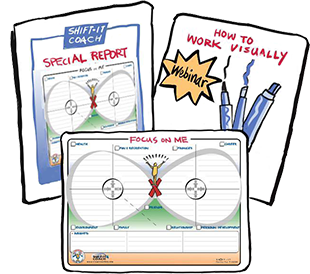 My SHIFT-IT work is about helping people get organized with graphic visions and plans. And doing their inner alignment work so they can really believe, allow and manifest what they ultimately want. My work aids some in getting in the vortex depending on where they are and how much they really do what I guide them to do. There are many, many ways to get in the vortex that aren’t related to drawing maps and/or directly working on your thoughts and feelings. Things as diverse as sleeping, meditating, walking in nature, getting angry, making love, reading inspiration literature, listening to Abraham recordings, dancing, cutting a good business deal, going to the beach, etc will pop you back into your vortex. The key is to develop some emotional awareness, collect and do/be things that work specifically for you. If you are resonating with ‘in the vortex’ and aren’t already connected with the Abraham-Hicks material I invite you to check it out. The workshop recordings are fabulous as are their live events (if you are in the U.S. there’s probably a location near you). 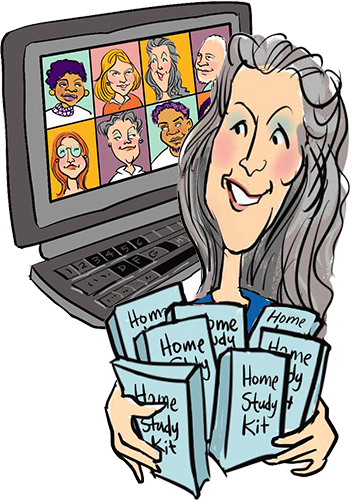 And they have a wealth of books; DVDS and other resources in their online store, just use your intuition to what most calls you. A good beginning place is their wonderful book, Ask and It Is Given (half the book is conceptual and the other half has 22 practical processes that you can do). “In the Vortex” is a great analogy and getting more popular by the day by the looks of what crosses my world. I hope this article has given you more understanding about what this phrase means and how you can apply it in your own life. All the best in getting in your vortex! This was a fantastic post. You expertly broke down the meaning of “In the Vortex”. I thought this was a well-written highly professional entry. If I had a website or e-zine I would definately use this article. Go Abraham! This was so beautifully and clearly written. It’s rare that I actually read a whole article, but I read every word! Hey there, Christina: I was doing a webseach for the term “Vortex” related to Abraham and recognized your site. I recently attended a workshop in Orlando and had the honor of being in the hot seat with Abraham, and gained unbelievable insights, which worked wonders in my relationship and my life in general. I loved what you wrote about the amazing work that Abe, Jerry and Esther are doing to inspire all of us uplifters to raise our vibes higher and higher. And, I am proud of what you are doing to share this with the world. You’re doing a fantastic job and I can feel your good vibes. P.S., I loved your drawing of the vortex! I draw almost the same thing every day in my book of positive aspects, to remind me to stay in the vortex. (((Smile))) Looks like great minds think and draw alike…hehehe. I have recently found the Abraham teachings, I have been very deeply inspired and it feels so right and true to me. I have been reading about LOA and other universal laws for many years now but I find this method of Abraham teachings to be the most powerful and easy to learn from. Thank you for promoting it. So Very Thanks For Your Nice And Useful Creation Here IMO, on the “Vortex” meaning in Abraham-Hicks’s universe. I have been listening to them for a while but just don’t get all they mentioned. Your entry has helped me a lot! Thank you! I’m new in this, and I was searching all around to get a clear understanding about this ”NEW” matter. I feel This might help us to have a deep inner sight, being more conscious and here to our self…. I have listened to Ester for a little while now and I have not heard her explain to vortex. Thank you for that information. This is the best explanation of the vortex that Ive seen. Even better than Abraham Hicks! I listen to AH almost daily and love it. Thank you for this excellent explanation! I really appreciate your explanation, I really didn’t understand the meaning, I have been listening to Abraham Hicks for like half a year. Hi can we say,being in the vortex is same as being in the heart? Hi Rufus. That’s not the language that Abraham-Hicks has historically used to describe what they mean by ‘vortex’. Although as an Energy Worker I would say that ANYTHING that brings you into your heart energy is a good thing (and raises your vibration, which in turn would make the vortex more accessible). AH uses ‘vortex’ to mean the accumulation of everything that you have focused on, but which you aren’t currently a vibrational match to. To ‘get into that vortex’ … you need to be of the same frequency. It may or may not be the frequency of the heart … but given the heart frequency is so wonderful, you can’t go wrong by revving that frequency up in your life. All the best to you.